Brett Luke | The Journal Gazette Trey Mckinney-Jones of the Mad Ants drives against Long Island Net’s Thomas Wimbush at Memorial Coliseum. The Mad Ants have been owned and operated by the Indiana Pacers for three seasons, but the relationship goes back much further. The teams have been at least partially affiliated since the Mad Ants began playing back in 2007. But the Pacers had never signed a player away from the Mad Ants – until today. The Pacers are signing guard Trey McKinney Jones, who has averaged 11.4 points, 3 rebounds and 2.9 assists in 26 games, after returning from a shoulder injury he had suffered during NBA Summer League. McKinney Jones, who won a championship with the Mad Ants in 2014, is known as one of the best defensive players in the G League. 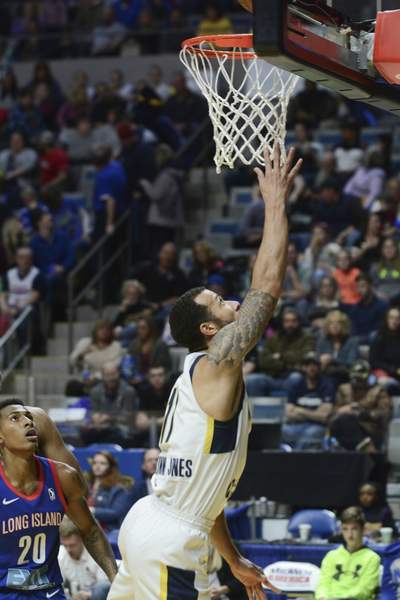 But the Mad Ants’ loss doesn’t just stop with McKinney Jones; they are also losing their leading scorer, Walt Lemon Jr., to the New Orleans Pelicans. No official announcement has been made by either team. Several sources confirmed to The Journal Gazette the signing of McKinney Jones, which has also been reported by ESPN. The signing of Lemon has been reported by Yahoo Sports. Lemon was averaging 22.7 points, 5.9 assists and 4.6 rebounds for the Mad Ants, who play Wednesday in Wisconsin. Both McKinney Jones and Lemon are signing 10-day contracts, according to ESPN and Yahoo Sports. McKinney Jones had been in Los Angeles, where he was on the roster for the G League All-Star team that was facing Mexico’s National Team, but he didn’t get in the game Sunday, possibly because he was about to sign with the Pacers, and couldn’t be reached for comment by The Journal Gazette. Lemon had been on his way to Wisconsin with the Mad Ants this afternoon.